Gabriel Taumua is a captain who leads by example. Family support is the foundation of any of success story and to be able to put a smile on your parents’ faces, while doing something you love, is a bonus. American Samoa’s Gabriel Taumua is one of the nation’s rising stars of the round ball game but there’s more than just the pressure of performing well on his shoulders. Tauma is not only captaining the U-19 national team as they bid for progression to the OFC U-19 Championship in Tahiti later this year, but he’s also has the added responsibility of being the son of the country’s football boss, Football Federation American Samoa CEO Tavita Taumua. “Mostly it is because of my dad, he’s the CEO of American Samoa,” Taumua said of why he originally took up the sport. The 16-year-old has been around football all his life with American Samoa football fans potentially recognising him from his minor role as ball boy and team mascot in the film Next Goals Wins, which followed the national team during its 2014 FIFA World Cup Brazil™ qualifying campaign. Having seen the path laid out before him, and the kind of jubilation and national pride that comes from representing American Samoa, Taumua has been patiently waiting for his chance to debut for his country. 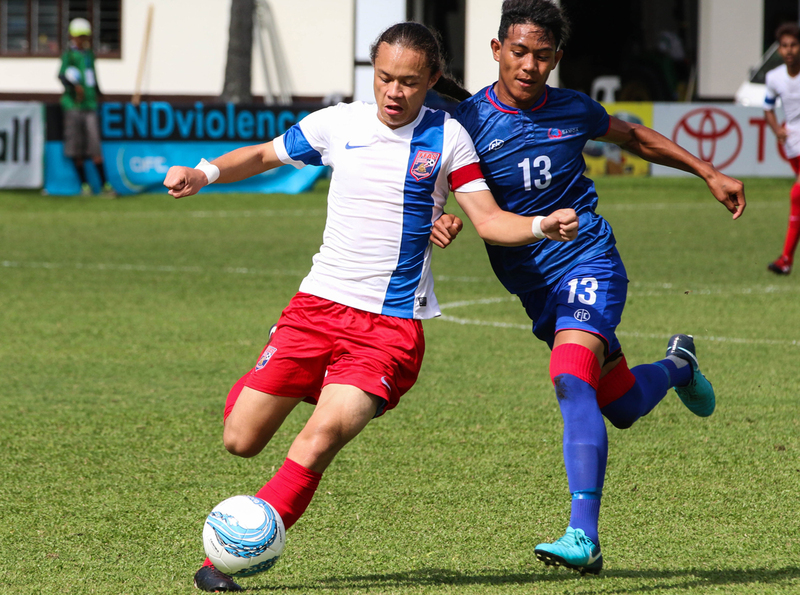 That opportunity came to him when he was 12 years old as he made his OFC U-17 Championship debut with the American Samoa U-17 national team on home soil. He’s since gone on to appear in an U-17 qualifier, the OFC Champions Qualifier and the Youth Futsal Tournament and this week’s competition in Rarotonga is his second U-19 appearance. While he may have started playing to be closer to his father, football has grown into an integral part of the young man’s life. “Football is like everything to me, it completes me and it is like my medicine and it cures me,” he said. Taumua is a key member of every squad he plays in and that is already evident in Rarotonga after just one match. The defender was key to helping keep Samoa contained for over 75 minutes and hopes that his performances will continue to inspire his teammates. “What motivates me is back home and remembering that my parents are cherring from home – my mum, my sister and the whole island – so that motivates me to be stronger and stronger,” Taumua said. Captaining the team in the Cook Islands is not Taumua’s first stint in on-field leadership, but he certainly displays qualities that make him an easy choice for his coaches. “I was the youngest in the U-17 in Tonga and it was a challenge for me to step up and be a leader,” he recalled. “Now I am here in the Cook Islands with the U-20 and I am the captain, I think it’s my job to be a leader and be an all-start for American Samoa. American Samoa’s next match will be against Tonga, a side riding high on the success of an opening win against their hosts. While it won’t be an easy match for Taumua and his teammates, the young leader is adamant the side will continue giving their all to make their friends, family and country proud. American Samoa will play Tonga on Tuesday 29 May (local) at the CIFA Complex in Matavera, Raratonga.